Tucked into the southwest corner of Arizona’s desert, Crane School District is one of two K-8 districts in Yuma. It has a very low socioeconomic population, with 100 percent of its students eligible for free or reduced lunch. Among the poorest districts in the country, Crane leaders were committed to locating additional funds to help support their dream of providing essential technological learning resources for their students. In 2014, Apple invited Crane to apply for the ConnectED grants. Realizing the magnitude of what that could mean for their district, they hired a grant writer and applied. Their acceptance to the program changed everything. Crane quickly transitioned from a 100 percent Windows district to a districtwide iPad program. The implementation allowed them to deliver transformational education that’s changing how teachers teach and students learn. 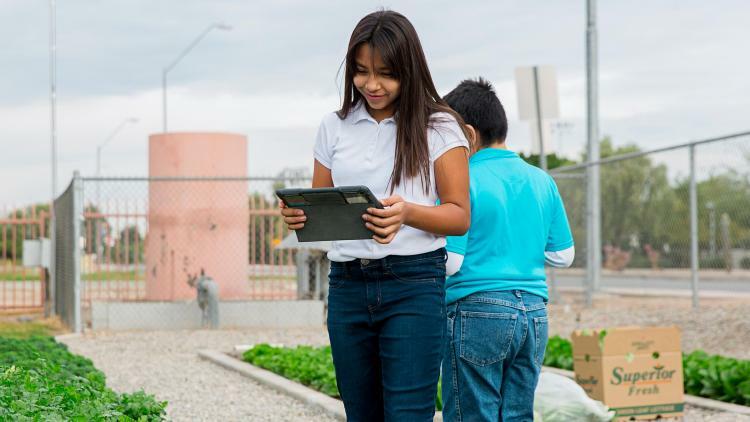 In addition to using iPads to manage a garden that produces around 20 variety of crops each year, the students are using their new experiences to develop deep, meaningful relationships with those who matter the most to them – their parents. The iPads also allow for strategic formative assessments that give teachers insight into how their students are grasping lessons. With snapshots of each student’s understanding of current classroom topics, educators can adjust lessons accordingly to meet the individual needs of each child. And it’s working. Crane has seen substantial, documented proof that their students are improving in key subjects like math, science and English language arts. Crane is halfway through their three-year ConnectED grants. And while they don’t know how they’ll continue to financially sustain the program, they know it can’t go away. What they’ve done with iPads, for the sake of the students, must continue. To learn more about Crane School District and their redefining learning with iPads, read the full case study.